In a patient without any symptoms or signs of neurologic disease, the examination for sensory function can be performed by quickly assessing the presence of normal sensation on the distal fingers and toes. The examiner can choose to test for light touch, pain, and vibration sense. If these are normal, the rest of the sensory examination is not required. If symptoms or signs are referable to a neurologic disorder, complete testing is indicated. As with the motor examination, the examiner compares side with side and proximal with distal aspect. Neurologic disorders usually result in a sensory loss that is first seen more distally than proximally. The hand is supplied by the median, ulnar, and radial nerves. 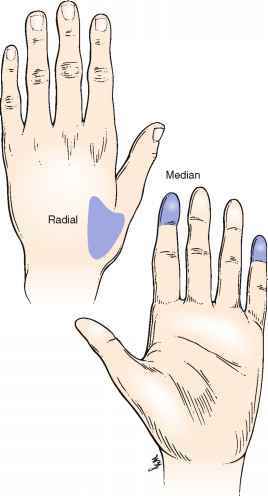 The median nerve is the chief nerve of sensation because it supplies the palmar surfaces of the digits, the parts of the hand most commonly used for feeling. The ulnar nerve supplies sensation only to the ulnar one and a half fingers. The radial nerve has its sensory distribution to the dorsum of the hand. There is considerable overlap in innervation. 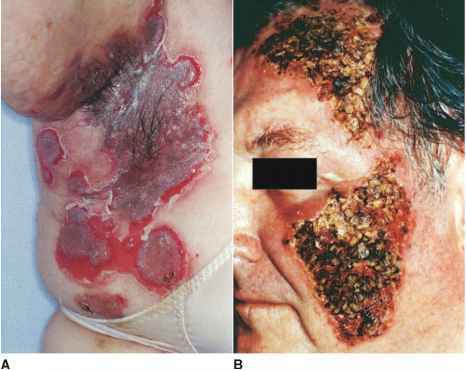 The most reliable cutaneous areas for testing these nerves are illustrated in Figure 21-47. These areas have the least likelihood of overlapping innervation. Light touch is evaluated by lightly touching the patient with a small piece of gauze. Ask the patient to close his or her eyes and to tell you when the touch is felt. Try touching the patient on the toes and fingers. This is demonstrated in Figure 21-48. If sensation is normal, continue with the next test. If sensation is abnormal, work proximally until a sensory level can be determined. A sensory level is a spinal cord level below which there is a marked decrease in sensation. Figure 21-49 illustrates the segmental distribution of the spinal nerves that transmit sensation to the spinal cord. Pain sensation is tested by using a safety pin and asking the patient if it is felt. Ask the patient to close his or her eyes. Open the safety pin and touch the patient with its tip. Tell the patient, ''This is sharp.'' Now touch the patient with the blunt end of the pin and say, ''This is dull.'' This is demonstrated in Figure 21-50. Start testing pain sensation on the toes and fingers and say, ''What is this, sharp or dull?'' If the patient has no loss of sensation, proceed with the next examination. If there is a sensory loss to pain, continue proximally to determine the sensory level. A new pin should be used for each patient. Instead of using a pin, you can use a wooden applicator stick that has been broken. Use the broken end for sharp testing and the cotton tip for dull testing. Figure 21-47 Most reliable cutaneous areas for testing hand sensation.